New No 116, Old No 01, Saidapet, Chennai - 600015, TamilNadu, India. Indira Projects and Developments (Tamilnadu) Private Limited is an ISO 9001:2008 certified company established in 2011 to create passionate technical implementation in all types of construction projects. Indira Projects main business vectors are Project Management consultancy and Real estate development. 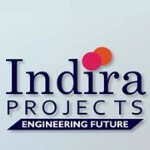 Indira Project is driven by young, energetic and reliable team with International Knowledge with local adopt. Indira Projects is committed to the respectful, thoughtful development of living areas. Our development provides privacy, space, amenities, functionality and preserves the natural beauty of land. Indira Projects always act with comprehensive responsibility of entire project delivery with clear engineering perspective. Indira Projects founder Mr.Bhupesh Nagarajan, a Graduate Civil engineer having more than a decade of experience in the construction industry in India, Singapore and Thailand. We have our presence is Singapore as M/s Indira Projects pte. Ltd, Singapore. Indira Projects is a Patron member of Builders Association of India and Indian Green building Association.